Most automotive advertisement and promotional materials produced during the first decade of the 20th century mirrored the overall confusion about what an automobile was, what its purpose was, and what its future was. With the exception of Cadwallader Kelsey’s innovative filmed commercials shown in nickelodeon theaters, and catchy tunes, most of this material was also word heavy, colorless, and Victorian in nature. Ernest Elmo Calkins had other ideas. In 1903 his fledgling advertising agency began applying artistic standards and text carefully evaluated to illicit a predetermined response. By 1908, Calkins & Holden had a well established track record for creating profitable advertising campaigns for their clients. The following year the company turned its attentions toward the promotion of automobiles; specifically, the luxurious automobiles produced by Pierce-Arrow, their newest client. Calkins & Holden didn’t break the rules of automobile promotion, they wrote the rule book. In the process they set the standard impossibly high, transformed Pierce-Arrow into America’s preeminent luxury car manufacturer, and launched an industry. Their advertising campaign for this automobile manufacturer commenced with the hiring of the worlds finest illustrators, many of whom were also acclaimed artists. 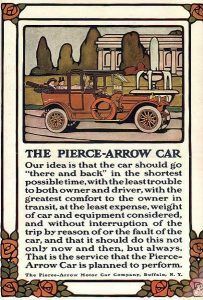 As a result, many of the promotional pieces produced by Calkins & Holden for Pierce-Arrow before 1920 are now considered fine art. The list of illustrators hired to develop Pierce-Arrow promotional material reads like a Who’s Who of the art world in the early 20th century. Among them were Edward Borein, a literal painter whose specialty was Remington type western life scenes and Ludwig Hohlwien, an internationally acclaimed German poster painter. Additional artists in the employ of Calkins & Holden during this period include Newell Convers Wyeth, a mural painter and illustrator of books penned by Robert Louis Stevenson, Louis Fancher, and John E. Sheridan, noted for his cover creations for Ladies Home Journal, Collier’s, and Saturday Evening Post. Initially, hiring such esteemed talent for the creation of automotive advertisement was not an easy task. The creation and development of advertising was deemed to be on a level with snake oil salesman and automobile advertisement was the crassest of all. In general, respectable illustrators and artists felt that such work was demeaning. So, the agencies first task was to sell artists on the merits of being linked with Pierce-Arrow, and by association, with the rich and famous that purchased the companies automobiles. 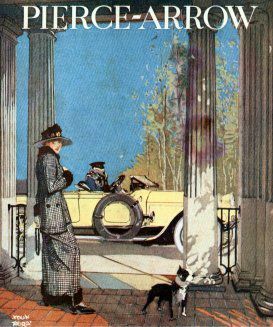 Pierce-Arrow Illustration by Guernsey Moore, 1914. Click for larger view. Courtesy The Pierce-Arrow Society. In addition, the artists associated with Pierce-Arrow through the agency were often treated as royalty. A story related by Adolph Treidler, an artist employed by the agency during this period, illustrates this and the fact that Pierce-Arrow was not your average automobile manufacturer. Even though Calkins & Holden’s promotions for Pierce-Arrow were revolutionary, they were also dated and archaic. The product they marketed was better suited for a genteel Edwardian society, not a society where mass production enabled the lowly common man to share in the luxury of owning an automobile. The Pierce-Arrow and the advertisement developed to promote it reflected the world of the super rich and royalty. Snob appeal was a key component in the selling of a hand crafted automobile that in its base form sold for more than five times the price of a new Ford, and several times the price of a Cadillac even though its mechanical components were hopelessly outdated. Still, Calkins & Holden’s bold use of color and text to portray the automobile as more than mere transportation opened the doors on the Madison Avenue advertising of the 20th century. The agency also served as a training center for a generation of advertisers. 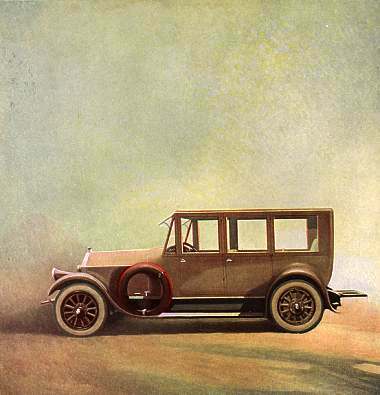 The Pierce-Arrow Sedan, Edward A. Wilson, Vanity Fair, January 1921. Click for larger view. Courtesy The Pierce-Arrow Society. Edward Wilson would later develop advertising materials for Coral Gables Coloration, La Salle, and Victrola. Walter Teague developed materials to promote the now legendary Marmon Eight, and The Brownie Camera. He also became a leading industrial designer responsible for some of the most stunning automotive designs of the forties and fifties. Guernsey Moore became the art editor at the Saturday Evening Post. Myron Perley later contributed his artistic styling to the promotion of Hupmobile. Cadwallader Kelsey gave us the automobile commercial. Calkins & Holden gave us automobile advertisement filled with vibrancy and color. 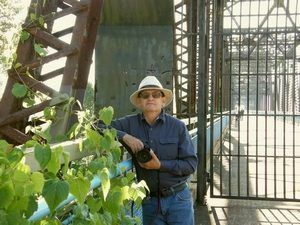 They also unleashed a generation of dreamers that did almost as much to put America behind the wheel as Henry Ford did with the Model T by making the sizzle as appealing as the steak itself.